Dental implants are effective and permanent solution for replacing missing teeth. They are posts made of titanium that are surgically placed into the jawbone to function as artificial roots that support the replacement teeth. Depending on your needs and condition our dentist will map out a treatment plan specifically for you. If you are missing one tooth, most likely you will receive one dental implant and a crown. However, if you are missing more than one tooth, an implant-supported bridge or denture might be the best solution. How to get a dental implant? In order to be considered for a dental implant, you must be in good general health, have healthy gums and enough bone to support the implant.Our dentist will evaluate your condition and needs before the procedure and outline your treatment plan. The next step is the placement of the dental implant in the jawbone. Our dentist will place a small titanium post into the socket of the extracted tooth and allow it to fuse to the jawbone before continuing the treatment. It usually takes several months for the bone to heal and the implant to bond to it. 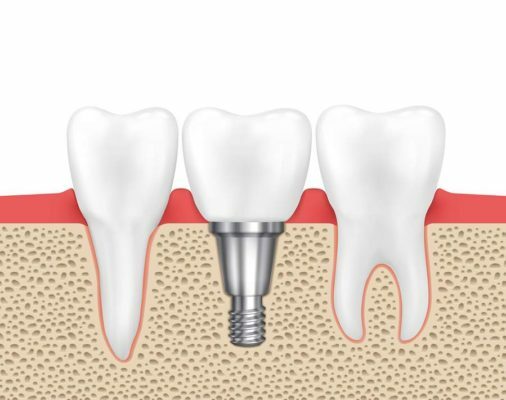 After the implant is securely fixed in the jawbone, the dentist will attach a connector post called an abutment which will hold the new replacement tooth. Finally, you will have a dental crown attached to the abutment to resume the function of a tooth. However, if you need to replace more teeth, you will receive a custom-made bridge or denture depending on your needs. Dental implants look and function just like your natural teeth.They are built to last and with proper oral hygiene they can last a lifetime.